Quite often when I grill, I also get a pan up there over the coals and sauté something for on the side. 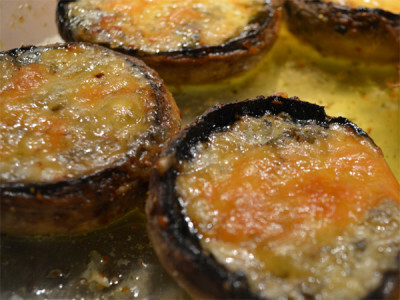 Mushrooms are a fave along with onions or some mixed vegetables, Mediterranean style, but if I do have time I prepare some mushrooms for the oven or under the grill and these cheesy baked mushrooms are to die for and a great way to use up any cheese that’s sitting around in your fridge. You don’t need many, maybe one or two each, but cheesy baked mushrooms make a great side dish next to that just off the grill steak! To prepare your cheesy baked mushrooms, get a large mushroom or two for each person, remove the stem and peel them. Without the stem they make a nice bowl. If you feel that is a waste then trim the stem down. By peeling the shrooms, this makes it easier for the seasoning to sink in. Right, so now you have prepared mushrooms, drizzle some olive oil in a bowl, finely chop a chilli, a clove or two of garlic minced or finely chopped and season with salt and pepper. Now you’re gonna get a bit messy here, but what you need to do is get those mushrooms into the bowl and make sure they are covered in that seasoned oil. When they are all marinated, place them on a baking sheet flat side down and pour over any left over oil. Get some cheese of your choice, I prefer to use a good Cheddar, but a Stilton or Gorgonzola can also be nice and either grate or crumble into the bowl of the mushroom. Bake in an oven 160°c until the cheese has melted then serve hot with the parsley sprinkled over the top. You could also put them under a grill for about 10 minutes too! These are also good placed onto the grill with the lid closed whilst your meat is resting.